A couple of 2-days Mass Awareness Camps on “Canal Fisheries Development” at Sundarbans and “Wetland Fisheries Development” at Media Baor, Gobardanga, West Bengal were organized under the SCSP Program on 23 rd and 25 th February, 2019 respectively. A total of 750 farmers participated in these two programs, out of which 86% were Scheduled caste communities and 12% were tribal farmers. The program at Sundarbans, Gosaba island, village Pakhirala was attended by around 300 farmers, where 24 numbers of Rotarians of Bubhaneswar, Odisha acted as resource persons, who are selflessly involved in different social activities for pro-poor knowledge up-liftment including involving themselves in livelihood improvement and addressed the farmers to make them involved in utilizing ICAR-CIFRI technologies for their additional livelihood support and eradicating mal nutrition prevailing in their localities. While addressing the farmers at Pakhirala, Dr. B. K. Das, Director, CIFRI urged the farmers to come forward and derive benefit out of the knowledge and support disseminated by CIFRI team for development of unutilized freshwater canals available in their areas for fisheries enhancement. He also imbibed the women participants to involve them in ornamental fisheries development for which CIFRI would provide need-based training support on regular basis batch-wise. The awareness camp was attended by Shri Kumaresh Biswas, Secretary, Farmers’ Club, Pakhirala, Shri Babu Sarkar, Vice-Chief, Panchayet Samity, Shri Rabindranath Sardar, Panchayet Member, Shri Sachindranath Mridha, Panchayet Member, Shri Samir Mandal, Secretary, Yuba Kalyan Samity, Pakhirala and addressed the farmers and requested them to utilize the knowledge shared by the CIFRI Scientists and Rotarians. At the end, Director, CIFRI and the Rotarians distributed plant saplings to the farmers. Another Mass Awareness Camp was conducted under SCSP program on Wetland Fisheries Development at Media Beel, Gobardanga, 24 Parganas (N), West Bengal on 25 th Feb, 2019 where 450 farmers attended the camp, with 82% SC communities and 13% ST communities. Seba Farmers’ Samity, Gobardanga and Fishers’ Cooperative Society, Media Beel took good initiative in arranging the camp at the beel site. At the outset, Dr. A. K. Das, In-charge, Extension & Training Cell, CIFRI invoked the farmers to come forward in getting the benefits of such training camp and strengthening their knowledge gap in regard to beel ecosystems and their functions reflecting into productivity enhancement. Even the derelict water bodies also to be brought under culture-based fisheries for livelihood support of the rural people-he reciprocates. Dr. Sanjib Kumar Manna, P.S, FREM Division, laid emphasis on judicious uses of chemicals in aquaculture as well as fisheries, while combating problem arising out of pest & disease infestation of the fishes. Utilization of antibiotics abruptly should be prevented in this sector, he urges. Considering huge scope for fish production enhancement from large wetland resources in this area as well as ornamental fish culture system development and interests of fish farmers/fishers there is need for more detailed training programs in small group of participants in future. 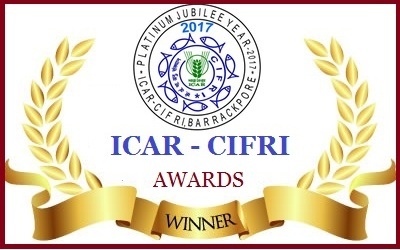 ICAR-CIFRI would extent all possible training supports in up- lifting the socio-economic status of the farmers of this area in the days to come in association with local Farmers’ Club and Fishers’ Cooperative Societies functioning in this locality.